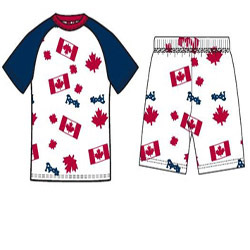 Health Canada has announced the recall of two more sets of children’s pyjamas over concerns that garments do not meet the design and flammability requirements for children's sleepwear under Canadian law. The recalls involve the four styles of Roots-brand boys and girls' sleepwear, which are made of 100% cotton and available in sizes XL, 2T, 3T, 4T, 5T, as well as various children's pyjama sets and sleepers by Arc-en-ciel. Children's sleepwear that is loose fitting or that has loose edges can contact ignition sources such as stove elements, candles, and matches more easily than tight-fitting sleepwear. Once ignited the sleepwear can burn rapidly and cause severe burns to large areas of the child's body, resulting in shock and sometimes death. Health Canada has not received reports of incidents or injuries related to the use of this sleepwear. Consumers are advised to immediately take the recalled sleepwear away from children and dispose of it in regular household garbage. For more information about these recalls, please visit the Health Canada website. For more information on previous recalls of consumer products for children, click here.